It might seem counterintuitive, but planning for the release of an album or EP should begin before the album is even finished. While delivering the final product is certainly a milestone, it is actually only the beginning of a successful launch. Your goal is to create awareness so that people will begin streaming it or buying it as soon as it is released. To do this, you need to ensure that your audience knows that new music is coming out and that they have interest in listening. Here are a few tips that will help you generate buzz and generally be prepared for your album release. One of the most important and attention getting things an artist can do is to release new music. If you release singles you can take advantage of having multiple release days and having more to talk about without much more additional work. But you should leave some time to create single artwork! We’ve seen people forget that until the last minute. Also remember that you don’t need to wait until an album is completely finished to start making the music available. Consider releasing one of your songs prior to finishing the entire body of work to give people a chance to sample your upcoming product. If a single gains momentum, it will help create buzz for the album or EP as a whole. If it doesn’t create a buzz, you will have this information to factor in to your marketing strategy for the new batch of songs. You might change your mind on what song to shoot an official video for if the single release doesn’t do well. In a previous article, we talked about how to get press coverage for your music. 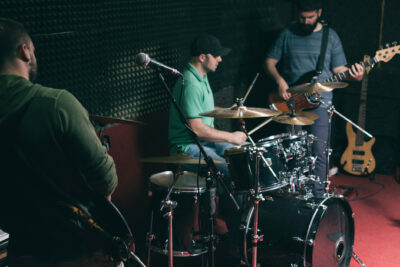 These strategies can also apply when promoting a new album or the release party. To get things started you can always write a press release and send it through a distribution service like PR Web. As the press coverage article mentions however, taking a more personalized approach by researching publications and individually contacting them to let them know about your music is key. When it comes to press be aware that a new release is much more interesting to journalists than something that has been out for a while. When approaching journalists and bloggers you may want to offer up a chance to be the first outlet to publish your song or video. These “Premieres” tend to be easier to sell than ordinary placements. In general – think through your release. Write up a timeline and make sure you conserve financial resources for promotion. It is all too common for great music to be made and released without a proper push behind it. → Should You Go To Music Business School?